December 21, 2018 – San Diego, CA. 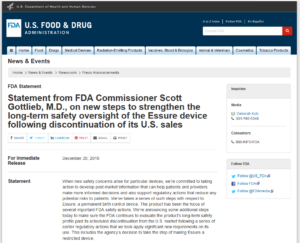 FDA has issued a new press release and statement from Director Scott Gottlieb on new safety concerns and safety study of the terrible birth control device called Essure. The FDA spent the past several months actively evaluating more than 15,000 medical device reports submitted to FDA in 2017 through June 2018 on the Essure device. Our take: While we feel this is good news, it’s very late and should have been done at least 4 years ago. We feel strongly that Bayer HealthCare rushed this product to market and the FDA did fast-track the process, women have been the unwilling victims of profit over safety. We intend to hold Bayer Healthcare responsible for the pain and continued suffering of thousands of women who have had the Essure Contraceptive device implanted. 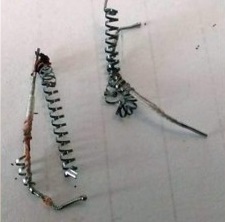 Essure is a type of permanent contraceptive implant made by Bayer and has been on the market for about ten years. Bayer HealthCare Pharmaceuticals claims that this device is 99% effective in preventing pregnancy, and mentions that it’s the only device that you can get with a non-surgical procedure. The device is a small metal polyester coil that once placed into a woman’s fallopian tubes makes her completely and permanently sterile. It acts by creating an inflammatory response in the body which creates scar tissue and basically blocks the fallopian tubes passage way. Recently, news stories have reported problems women have had once they’ve had the device inserted. The FDA approved the device in 2002 after a fast-track review process. The FDA, in a redacted study, has now counted 5,019 adverse affects and problems related to Essure. The original manufacturer, Conceptus, was acquired by Bayer HealthCare, which continued to heavily market the device. Bayer says that the product is in use in 23 countries and there may be as many as 750,000 devices currently in use. It is unsure of how many women in the U.S. have the device. The FDA has received 1,077 reports that included 1,113 pregnancies in patients with Essure. Some reports contained information on multiple pregnancies. Of the total pregnancies reported: 253 live births were reported; 386 did not indicate whether the pregnancy resulted in a live birth or pregnancy loss; and 474 pregnancy losses were reported. Among the 474 pregnancy losses reported: 138 were reported as ectopic pregnancies; 75 were reported as elective terminations of pregnancies, and 261 were reported as other pregnancy losses. Will this affect Essure current or new lawsuits? Hard to say at this moment until we fully understand this FDA move. It might possibly mean some states that have limitations on these types of lawsuits may restart the time frame for victims hurt from Essure. If you, or someone you love, has had the Essure Birth Control device and has had ANY adverse side effect we’re on your side. Contact our lawyers and attorneys today for a FREE case review. Doing so will provide you with the knowledge that you need to make a sound decision regarding how you should proceed through this difficult time.